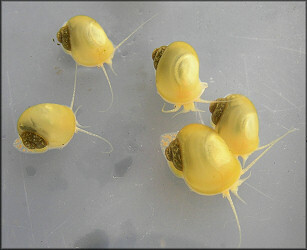 In an attempt to determine why the Pomacea population of the lake is apparently so small, a freshly deposited egg clutch was obtained from the lake shoreline on 7/14/2007 and taken home and maintained in a state roughly approximating the conditions it would have been subjected to in the wild. 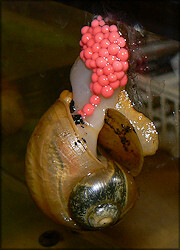 The clutch began hatching on 7/26/2007 but only 34 of the individual eggs ultimately hatched. 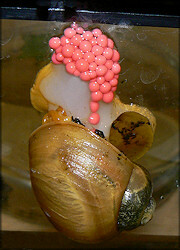 The egg clutch was monitored until 8/11/2007 but no further hatching was observed. 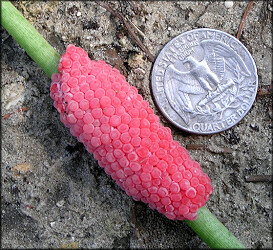 While only a relatively small number of the individual eggs hatched, those that did appeared to be healthy, readily fed on Romaine lettuce, and rapidly increased in size. 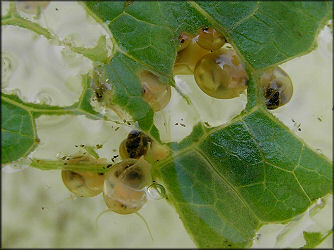 The baby snails thrived on their diet of Romaine lettuce and by 1/15/2008 the largest of the group had attained a size of about 35 mm. 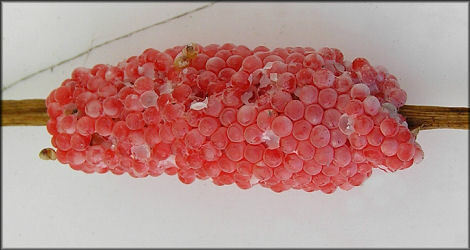 Subsequently during the evening of 1/27/2008, one of the larger females crawled to the top of the aquarium glass and deposited an egg clutch (see images above) - thus the time period between hatching and depositing an egg clutch was almost exactly six months. During this six month period there was limited mortality with only two of the original 34 hatchlings not surviving.